Apparently having two daughters is the key to happiness. According to a survey, a poll of 2100 families in the UK; with 12 possible combinations of children found that having two girls will most likely provide a happy home. Two daughters is said to be helpful, compatible, peaceful, and therefore contributes to a harmonious family life. Anyone who knows me know that I adore boys. If I could choose the gender of my next child, I would want to have another son! My husband however, will strongly oppose. Generally, boys just seem less complicated. I’m mostly terrified of those dreadful teenage years when girls are psychotic, emotional train wrecks who are full of attitude, drama, and tears (or so I remember). I wouldn’t know how to deal with any of it, nor would I want to. With boys, I would be safe from those awkward conversations relating to the male’s physical and hormonal development. At least I hope to depend on my husband for that. Plus, I can’t image a happier life than with my two boys. Ultimately, having no children would have to be the worst. My baby is expecting his first adult tooth! Tyler is officially a big boy! They say losing a baby tooth is the ultimate sign of becoming a big kid. My son first discovered his tooth was wobbly three weeks earlier, on our trip to Lafarge Lake when he heard a “crack” as he bit into a corncob. There was this uncertain, and almost frightened but excited look on his face as he tells me, “ I think my tooth is wiggly.” My heart just melts in that instant. I couldn’t help but have this huge smile that seemed to go all the way across my face. Times like this that I absolutely appreciate being a stay-home mom, I get to be there for every single milestone, however big or small. Tyler came home from the park last week, extremely ignored by this tooth which was quite loose at this point. 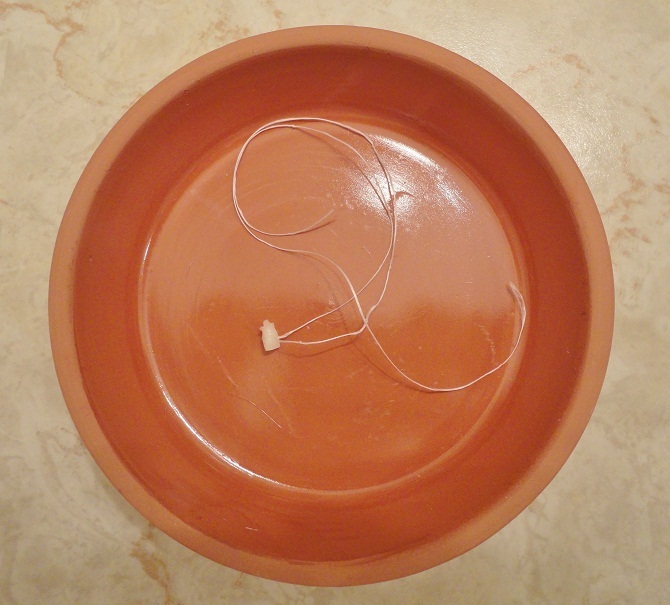 I wanted to wait for the dentist, whom we had booked for following week, but my husband suggested we do it the old fashion way: with a string. I was nervous, but mostly afraid that if we didn’t do it correctly; leaving any broken piece in the root socket that it would give rise to complication such as pain or infection, and thus possibly affecting the adult tooth. After some research and a few YouTube videos, I was more confident in our success rate (what would we ever do without YouTube?!). Tyler was scared, but agreed to do it for extra game time. Floss was the recommended choice and to either pull up or down on the tooth, instead of forward. The floss slid out on the first two attempts to pull it upward. On the third try my hubby pulled it the opposite direction and it came out clean, with very little blood and was almost painless. Whew. Tyler was thrilled to find that the Tooth fairy had left him a whopping $1.30! My little bugger just turned four! If you’ve been reading my blogs, you probably know that my boys are bug fanatics. So, what better place to celebrate Christopher’s fourth birthday than a learning adventure at the Honey Bee Center? 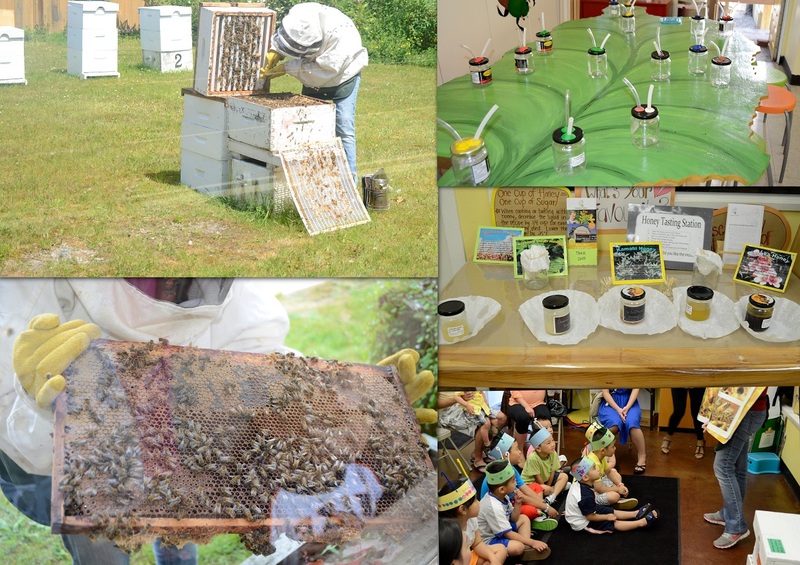 The children had a fun-filled and educational day at the Bee exhibit center where they learned all about the fascinating world of honeybee. 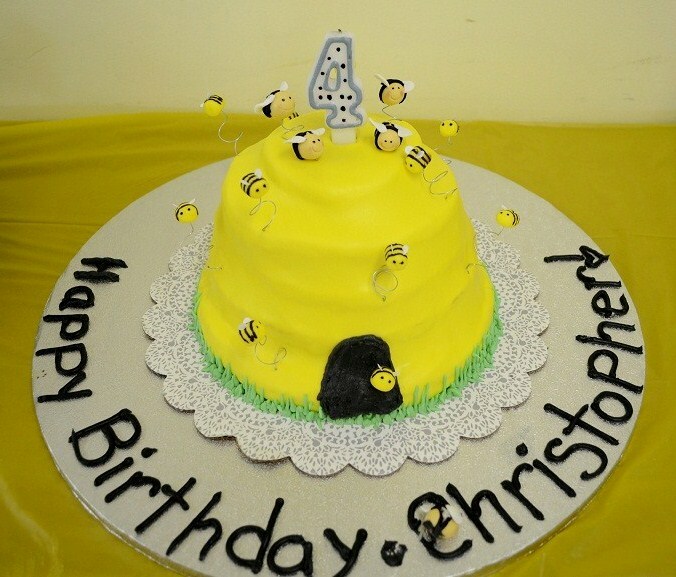 They saw a live beekeeping demonstration in which Christopher was offered the opportunity to assist the beekeeper as a birthday treat, but he didn’t like the idea of being next to a swamp of bees. I probably would have declined too. 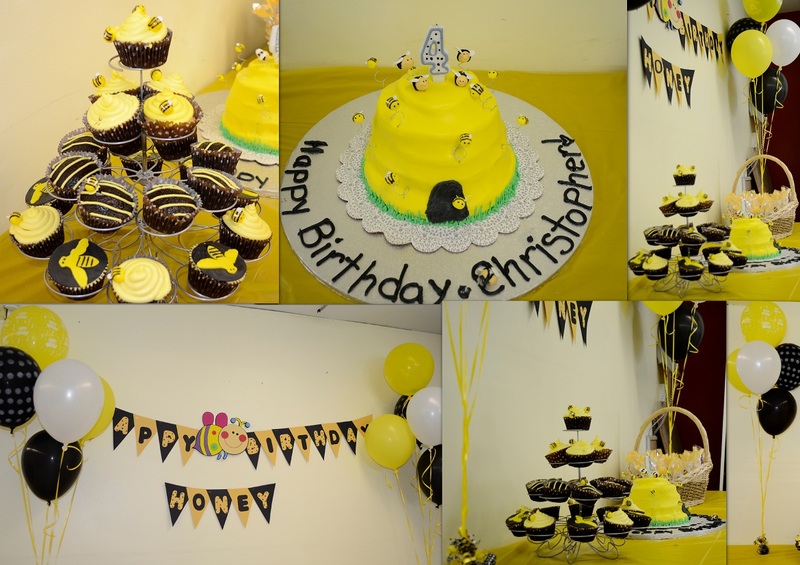 The birthday boy and his guests made a bug catcher, went on a scavenger hunt in the bug lab, tasted a variety of honeys and sample bee pollen, and at story time they learned the life cycle of bees and how important these flying insects truly are. 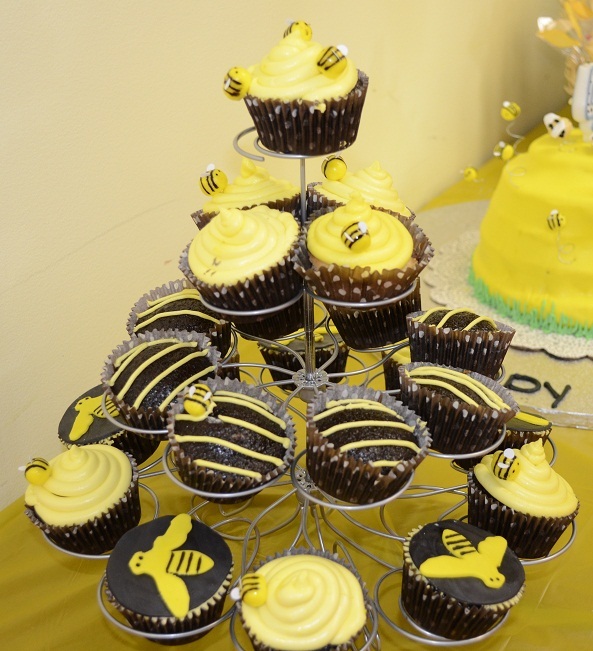 Thank you bees for all that you do. It was a knowledgeable experience for me as well. Did you know all worker bees are female, and they do not hibernate in the winter time, hence the popular phrase “busy bees”. The male honey bees on the other hand, are good for only one thing. Once they’ve served their purpose the drones are quickly discarded. A World run by females, yah! My son is growing up so fast! Tyler just turned six! I still can’t believe how big he’s gotten; already he weighs more than half my body mass and soon will fit into his father’s shirts. Don’t worry, he’s not overweight. We the parents, being Asian and all are simply ectomorphs, thus petite by nature. I never would have guessed that motherhood can be so amazingly wonderful; I wouldn’t have imagined someone so little can change my whole world, nor would I ever thought something as simple and small as a smile can fill my heart so full. I am so grateful for the chance to be a mother, to my sons. They are the most precious things in life and my greatest accomplishments. Of course motherhood isn’t all sunshine and roses, but it’s hardly comparable to the overwhelming feeling of love and joy one gets as a parent. It’s really the best job ever!! The cake turned out better than expected,yah! After weeks of preparation, it was party time. Everything turned out as planned. In fact, it was better. The weather couldn’t have cooperated more for our backyard b.b.q.,it started pouring right after the party ended. We lucked out. 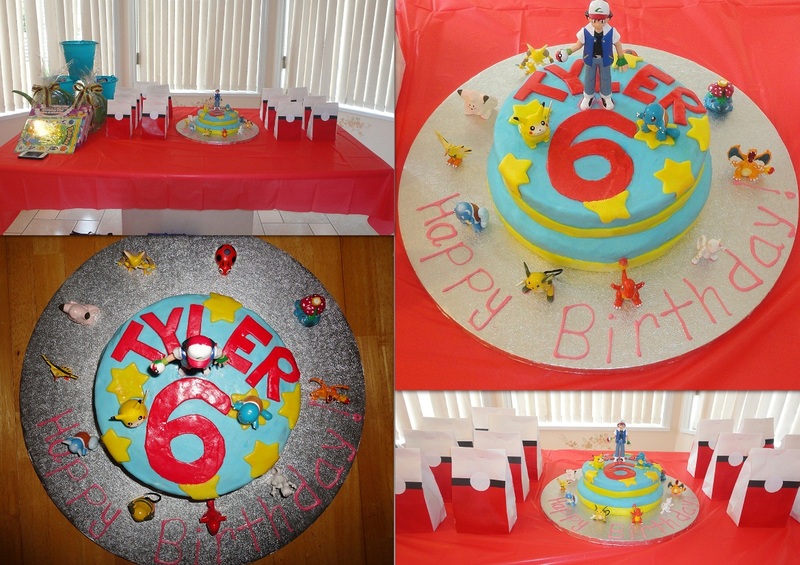 Tyler loved the Pokémon theme, his friends didn’t seem to noticed. They were just happy to be running around like loose cannons. 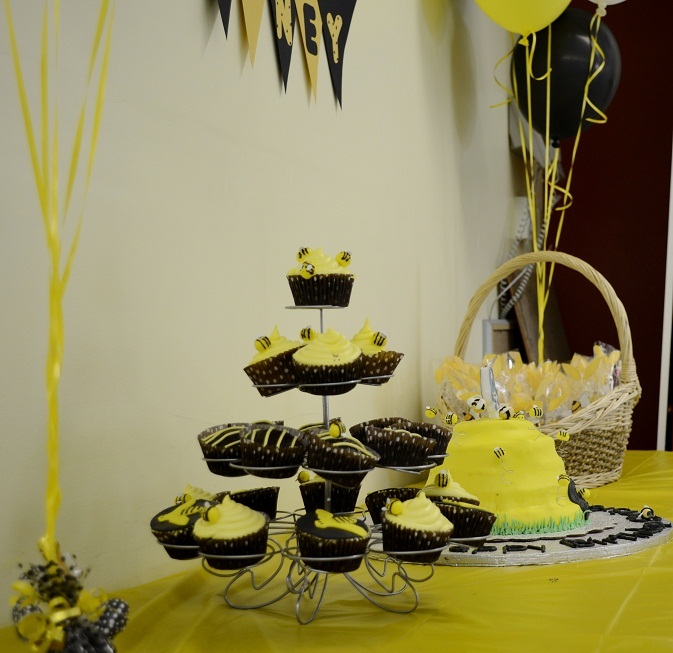 My son felt super special, so I’d say this birthday bash was a smashing success! 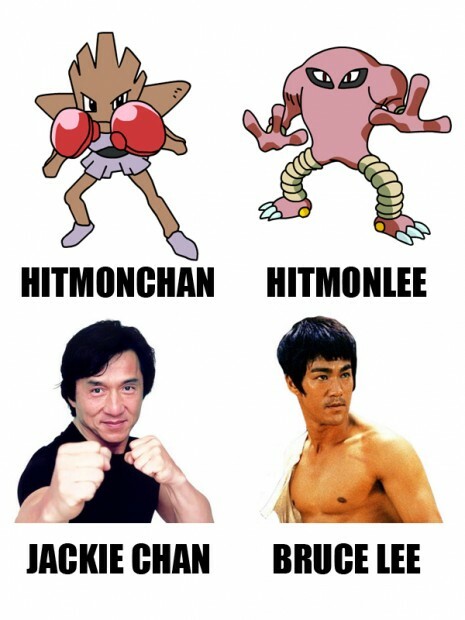 Seriously, who came up with these Pokemon names??? 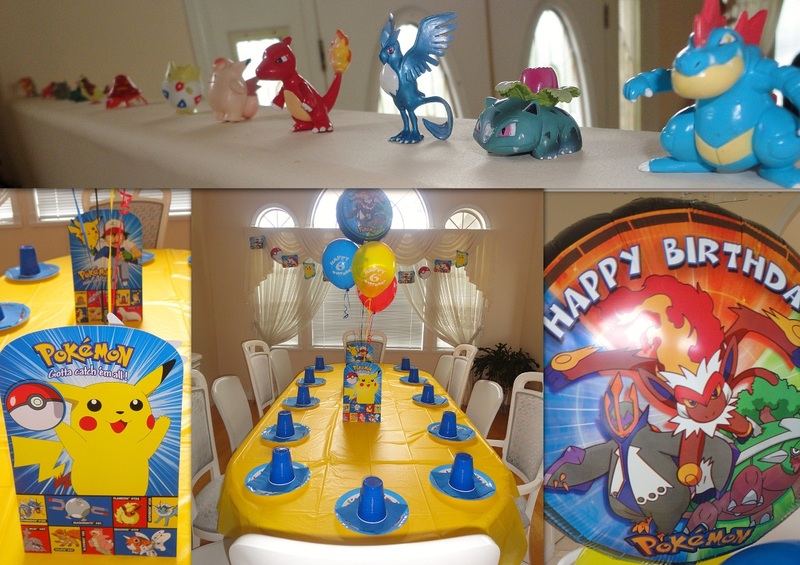 My son is turning six and like a lot of the primary boys at his school is obsessed with Pokemon, which by the way translates to Pocket Monsters if you didn’t already know this. I had a whole 10 minutes conversation with these grade three boys one morning where one of them showed me his deck of 200 cards, including the “rare ones“, I learned that these are also called EX cards. Apparently they have more HP (hit points) than the others. I wouldn’t know, they all look the same to me, except for the shiny ones, those are pretty. I would collect them. To think this all started with one man by the name Satoshi Tajiri who first created a video game based on his childhood hobby of collecting insect, and from there it skyrocketed into a multi-billion dollar franchise! My boys have yet to play the video games but they sure enjoy watching the anime series and collecting Pokemon cards, even though neither they nor I know how to actually play the card game. Personally, I think it’s overhyped; I mean the Pokemons never die. Now what’s the fun in that? My biggest issue is that I haven’t the slightest clue how to properly pronounce the names of these fictional creatures. You give it a try and see that I’m not exaggerating: Masquerain, regigigas, Grovyle, suicune, Mismagius, Gyarados, Kyogre, just to name a few among nearly 500 different species. The rest are just as ridiculously hard to pronounce. Iam sure it must have crossed your mind as to how these evolving pets get their names. 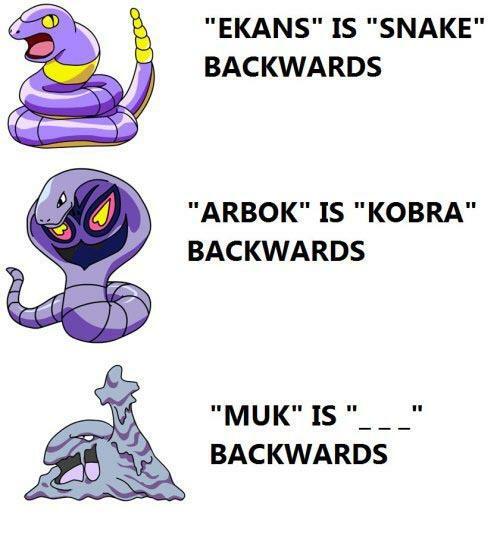 Well, here are a few fun facts about Pokemon names. Pika = electric spark , chu = means squeak, the sound made by mice. 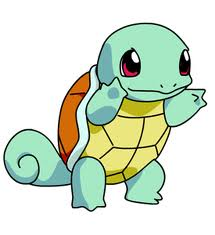 With Tyler’s birthday fast approaching I’ll be doing much research on this topic as I am sure Pokemon is on the menu. 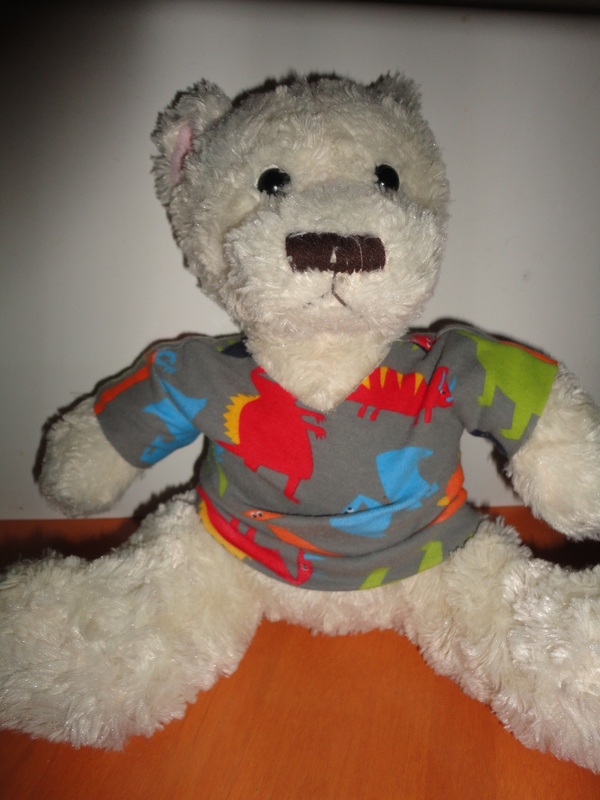 Tyler asked me to sew a T-shirt for his friend Snow Bear. You see, Snow lives in the North Pole so he can’t possible go about clothesless, because apparently his double coats of fur aren’t thermal insulated enough that he must immediately require a layer of 100% cotton. Hmmmm… Son, you know this doesn’t mean diddly-squat if he’s in the Artic right, assuming he needs it all? We went digging at once, and found a pair of Tyler’s old pajama pants that like any other pants of his, has a huge ripe on the knee. And usually I would patch it up, because other than the hole, the rest of it looks new. But, this particular pair was beyond repair; not only is the opening the size of a black hole, the surrounding area is scuffed, scratched, faded, thinned and starting to run. It’s the sight of a hungry beast attack; this was the work of an obviously picky eater who’s only desire is the patella. 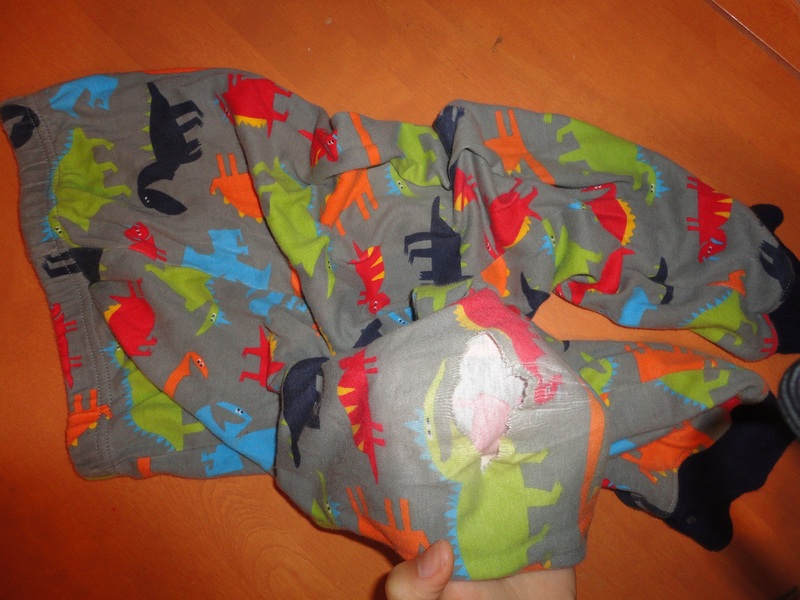 Does this ever happen to your children’s pants, especially with the boys’? Shortly after possessing them (usually after the third time) there appears to be a visible sign of distress in the knee, with Tyler it’s always, ONLY on the right side. I can’t help but think that my son must have one gimped knee cap that sticks out and gets into all sorts of trouble. 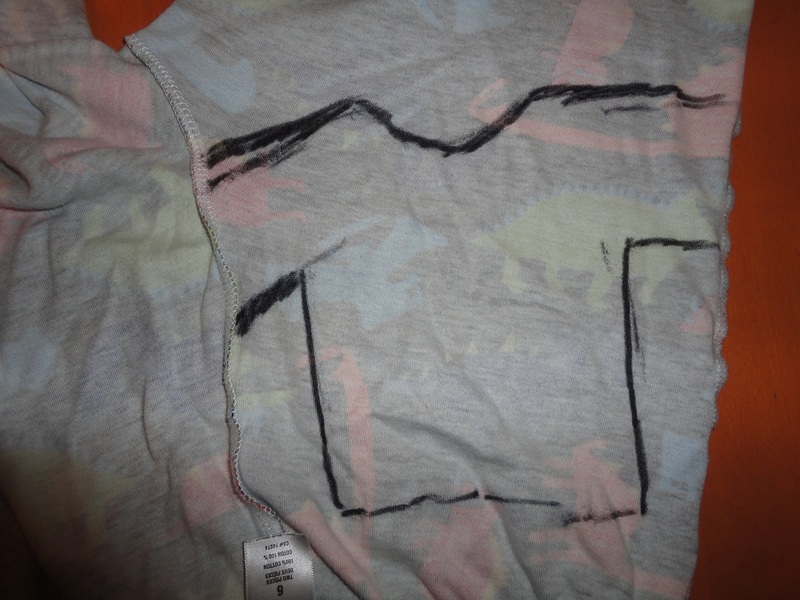 Since Tyler still has the top for that pajama I decide to recycle the bottom part and make the two friends matching shirts. Now compare it to the other leg. The mystery remains. Ever thought of why boys’ and girls’ preference in toys are so different? For instinct, boys enjoy playing with cars and plastic dinosaurs while girls prefer Barbie dolls. I always thought this is because different genders are socialized and taught differently, as a result parents and society determines their choice in this matter. However, based on recent scientific evidence, it is possible that genetic, hormonal and certain biological links may also play a role in their discussion. 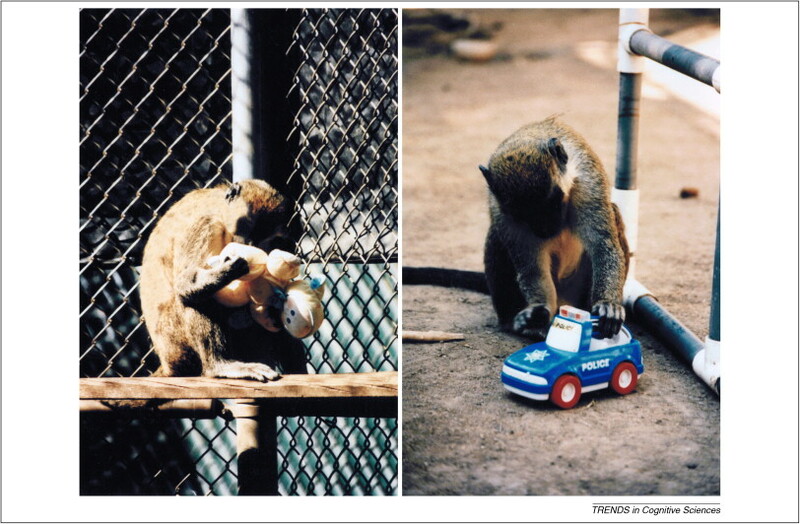 Tests done on vervet and rhesus monkeys revealed that the majority of male monkeys choose boyish toys while the females showed a strong preference in stereotype feminine toys. 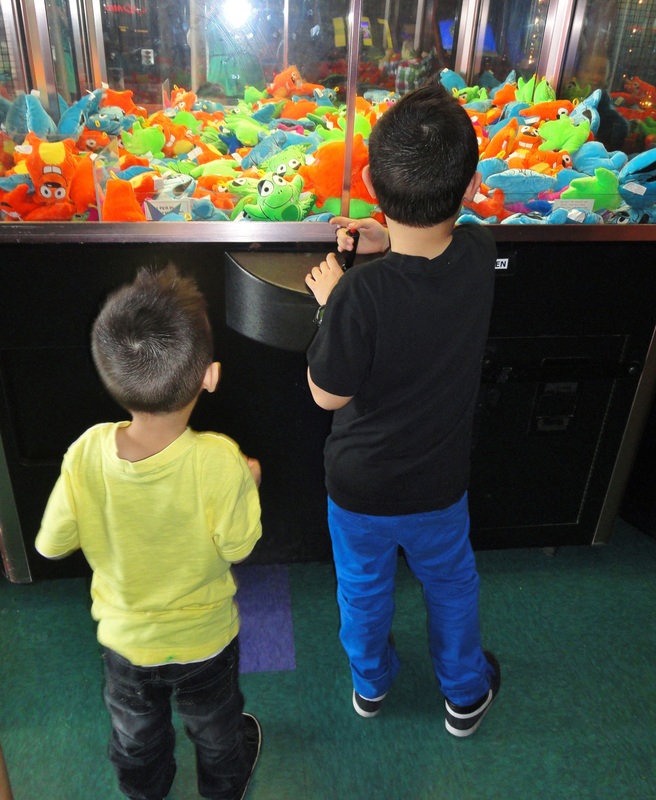 These experiments alone does not explain it all but it does suggest that even with the absent of social pressure or human cultural influences different sexes are drawn to specific toy choice. Who knew! My boys were crazy about Thomas the tank engine and friends. 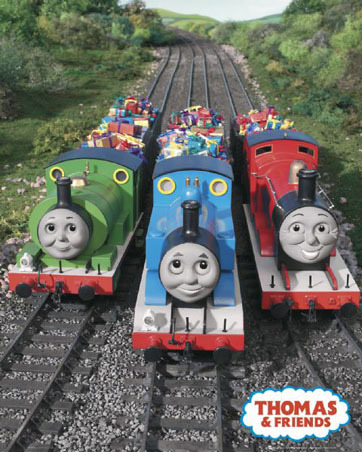 The boys have watched and re-watched all of Thomas and friends animated series, both old and new versions. I’ve seen it tons of time that I too have started to memorize the scenes and names of characters. My personal favourite in the island of Sodor is Percy, engine #6. This little green saddle tank is clumsy and accident prone, but he is also a very loyal friend. I found myself watching one episode after another, while Thomas showed us the value of friendship and team work. I never watched Thomas as a child as I found these creepy-looking, talking trains uninteresting, and rather dumb. But, now I see why it’s still around after 28 years and remains a classic favourite. The boys have a wooden train set that is surprisingly still in tack. It is well-loved and has gotten more attention than I had. There’s something extremely amusing about building tracks and then watching the trains zoom over the bridges and through the tunnels. Through the years my kids have owned numerous Tonka cars and Chuggington trains. 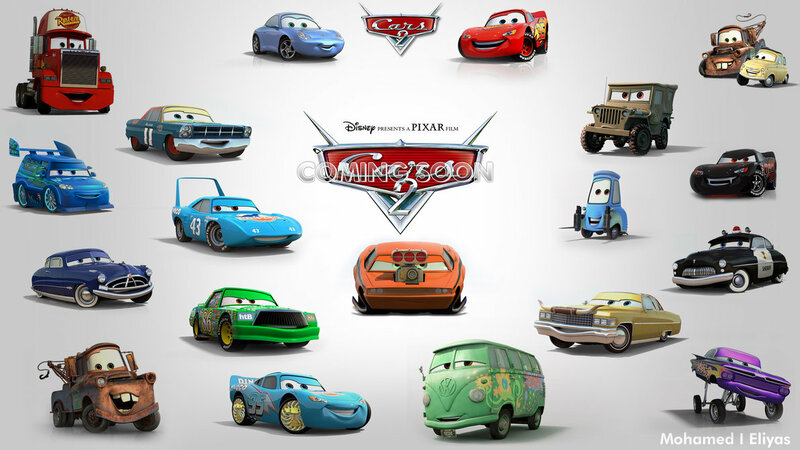 They possessed too many Disney’s wheeled characters such as Mater and Lightning McQueen from the movie Cars. 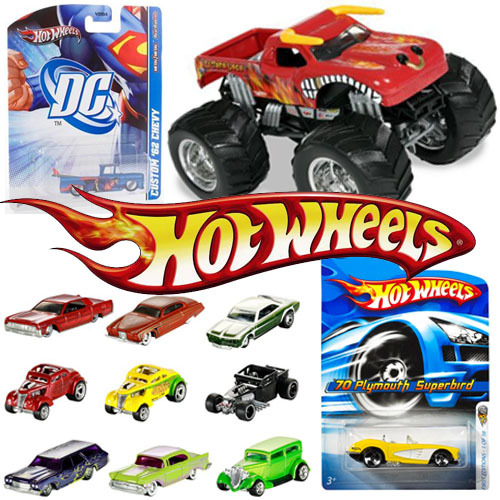 As of late, hot wheels are the coolest vehicles, especially if it came with a battery operated race track. The boys love exploring all the different ways to build the track and discovering new tricks. They find entertainment in watching the cars jump off the ramp at high speed, and crashing, of course. If theres one thing i know for certain, is that boys will always to be rambunctious. I am beginning to understand why men are obsessed with fast cars. As much as I like the idea of men sitting, I really don’t see much sense in banning urinals in men’s washroom and making it illegal or politically incorrect for men to pee while standing up, like the feminists of Western Europe are determined to do. My sons were both potty trained by their second birthday. There were the occasional accidents during the night but otherwise they were completely diaper-free, not even pull-ups. Patience and persistence definitely paid off, and it sure helped to have a couple of very cooperative boys. Since two, they have urinated standing up. The splatters has minimized now that the boys no longer need the stool and their aims have gotten somewhat more accurate. 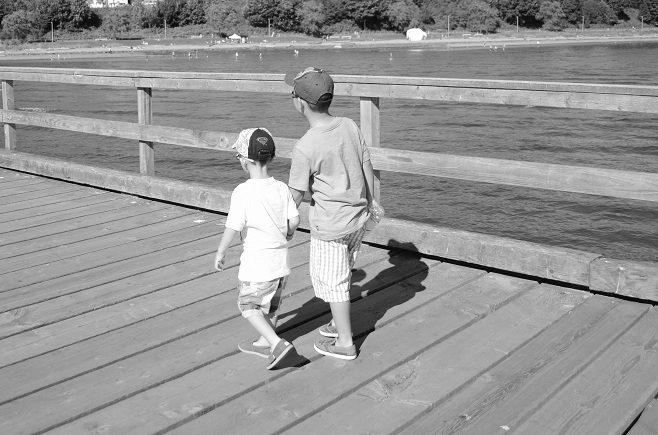 Ideally, I would love for my sons to empty their bladder as they’re sitting down. I would think that’s every mother’s dream. However, my husband thinks it’s unmanly (unboyish?) for boys to pee sitting, but then again, he’s not the one cleaning the washroom. Anyway, since I am not a man and don’t know how these things work, I gave him the benefit of the doubt. Lately, I’ve been noticing some puddles around the toilet. It doesn’t help to narrow down the perpetrator when there’s four potential suspects. So, I’ve been doing some reading and found that it’s normal for boys/men to sit during micturition. In fact, a lot of men do it, but not in public, which I agree with, and especially at night time, according to many forums and the Is it normal for men to pee sitting down? pole. I’ve since presented this information along with the pros and cons of this topic to my loving partner. I would like to say that he sided with me after hearing the logics, and seeing how the pros have outweighed the cons, but it was the persistent pestering that really did the trick. Never underestimate the power of nagging. At some point my children will choose for themselves what best suits their needs. For now, while I still have some power, I think I might retrain my boys, only when they’re in my lavatory anyway. Who says you can’t have fun dressing up boys? Not I! I love to pick out my sons’ wardrobe, more so than my own even. Now that I’ve said it out loud there’s definitely something wrong with that. Lol. I try to keep it interesting, avoiding the typical strips and solids whenever possible. I like to prove to people that you don’t have to have a girl to have fun playing dress up. Except for when it comes to school that’s a whole different argument and set of rules. My sons generally let me create just about any looks, as long as they don’t have to model for more than two minutes. After that they begin to fidget uncontrollably and break out dancing or transforming into one of their favourite superheroes. I would say that’s one of the biggest disadvantages of dressing for boys. I am super excited that florescent colors are back on the shelves. Right now I’m obsessed with Zara’s spring collection for boys! Seeing all those vibrant hues just makes me so happy, like a kid in The Sweet Factory. The boys’ fashion has mostly been inspired by the contemporary punk meets skater look. So, naturally skinny jeans are high on the must-have list. God only knows Tyler has owned his fair share of them. So when they came out in a selection of bright colors how I can deprive him? Absolutely not! He’s got one in almost every color now, expect for yellow and orange, oh and pink. They’re decently priced at H&M, my other favourite Label.